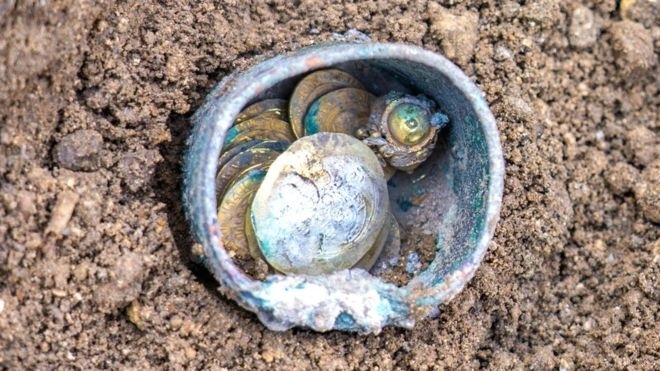 AKIPRESS.COM - A collection of gold coins believed to have been hidden 900 years ago has been discovered by archaeologists in the ancient Israeli port city of Caesarea, BBC reports. The rare cache was found - along with a single gold earring - in a bronze pot between stones in the side of a well. The hoard of 24 coins appears to have been hidden by someone who hoped to retrieve it, but never returned. Archaeologists say the owner may have died when the city's inhabitants were massacred by a Crusader army in 1101. The discovery was made during an excavation and conservation project at the Caesarea World Heritage site. The 11th-Century coins were found between two stones in the side of a well at a house in a neighbourhood dating to the Abbasid and Fatimid periods.